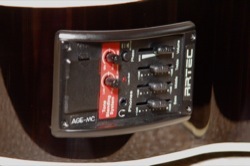 After quite a bit of internet rooting, a unit was found that would cover the hole in the guitar’s side. Great. Just one problem though… Although the bezel covered the hole, the mounting screws were located such that the front two had nothing to screw into (see the locations marked on the blue masking tape). The solution: glue in some wood for the screws to mount in. As this is the shoulder of the guitar though, the wood patch needs to be bent, or curved, to mate properly with the guitar’s side. No problem. Out comes the trusty bending iron. I cut a piece of mahogany a bit larger than needed for the final patch as tiny pieces are very difficult to bend. Even larger pieces need gloves as that iron gets hotter than the surface of the sun. Making sure to keep the mahogany damp, I gradually worked the wood until the heat and steam loosened the fibres—you can feel this happen. Then, working along its length, I bent the piece to the right curvature to match the guitar shoulder. Once it was there, I clamped the bent wood in an acoustic mould (I picked a suitable position to mate with the bent wood) and waited for it to cool and dry. I could then cut it to shape and glue it in place. The sides of an acoustic—and in particular, this area—don’t play a huge part in its overall tone. This is why it’s possible to cut bloody, great holes for preamps in the first place. This patch is not going to have any effect on the guitar’s sound. It will, however, allow the new preamp to be mounted and will get this guitar gigging again. This article was brought to you by Gerry Hayes from the workshop of Haze Guitars and is cross-posted there.